The following information was adapted from Bruce Block’s The Visual Story: Creating the Visual Structure of Film, TV and Digital Media chapter 7 starting on p. 167. Block, Bruce. The Visual Story: Creating the Visual Structure of Film, TV and Digital Media (p. 167). Block, Bruce. The Visual Story: Creating the Visual Structure of Film, TV and Digital Media (p. 168). Block, Bruce. The Visual Story: Creating the Visual Structure of Film, TV and Digital Media (p. 170). Block, Bruce. The Visual Story: Creating the Visual Structure of Film, TV and Digital Media (p. 171). Block, Bruce. The Visual Story: Creating the Visual Structure of Film, TV and Digital Media (p. 172). Block, Bruce. The Visual Story: Creating the Visual Structure of Film, TV and Digital Media (p. 174). Block, Bruce. The Visual Story: Creating the Visual Structure of Film, TV and Digital Media (p. 182). 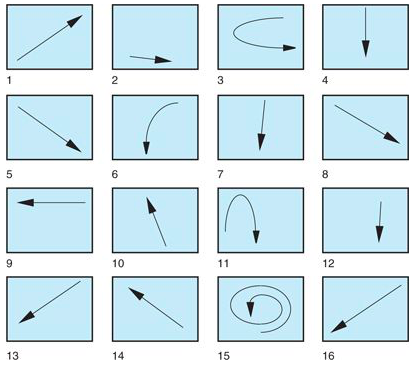 The importance of continuum of movement in a shot or series of shots can be planned in a storyboard. The arrows in each storyboard picture indicate the movement of an object in the frame. Block, Bruce. The Visual Story: Creating the Visual Structure of Film, TV and Digital Media (p. 188). 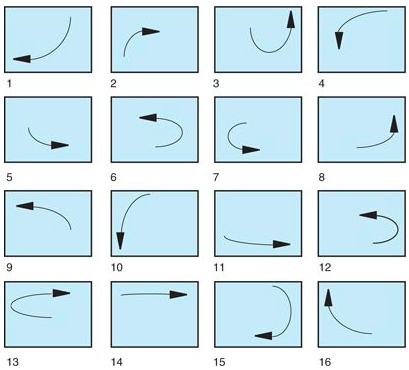 In Storyboard #1, notice the curved (curvilinear) tracks and the affinity of continuum of movement. The viewer’s point-of-attention will be left off in one shot and then picked up in the next shot in the same quadrant. Combining all the pictures into a single frame reveals the linear motif created by the tracks of object movement from shot to shot. The eye’s path of movement is choreographed around the frame in a circular manner. The affinity of continuum of movement reduces visual intensity and smoothes the transitions from shot to shot. Block, Bruce. The Visual Story: Creating the Visual Structure of Film, TV and Digital Media (p. 189). Storyboard #2 uses straight lines or tracks instead of curves, but there’s still affinity of continuum of movement. The incoming movement starts in the same quadrant where the outgoing movement stops. Block, Bruce. The Visual Story: Creating the Visual Structure of Film, TV and Digital Media (p. 190). When all the pictures are superimposed into a single frame, the linear motif is revealed. The straight, angular lines or tracks create a smooth continuity, generated by the affinity of continuum of movement. Storyboard #3 is full of contrasts. There’s contrast of straight and curved lines; diagonal, horizontal, and vertical tracks; and contrast of continuum of movement. The point-of-attention quadrant is never the same from shot to shot. 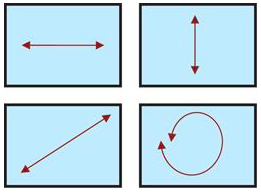 On each editorial cut, the audience must shift their point-of-attention to another quadrant to find the next moving object. Block, Bruce. 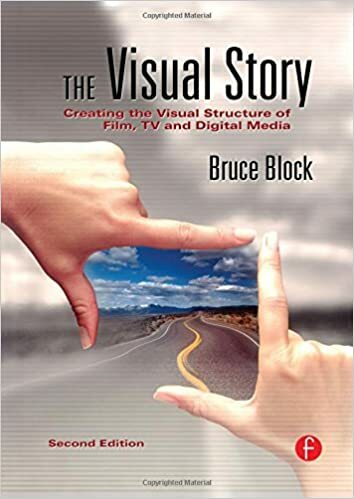 The Visual Story: Creating the Visual Structure of Film, TV and Digital Media (p. 191). This is the linear motif of the pictures in Storyboard #3, which is most intense because it uses so much visual contrast. The total number of lines has doubled. Not only are there lines generated by the tracks of the moving objects, but there are also lines produced by the track of the audience’s moving point-of-attention. Storyboards #1, #2, and #3 create a visual progression. Based purely on the amount of contrast and affinity, Storyboard #1 is least intense because it uses visual affinity. Storyboard #3 is the most intense, because of the visual contrasts of line quality, direction, and continuum of movement. understands continuum of movement has an additional tool to manipulate the intensity of scenes and sequences. Once in the editing room, it’s easy to determine where the audience is looking in any shot. View the shot and be aware of your own point-of-attention. Stop the footage and mark the viewing screen with a grease pencil. You’ve probably found the correct point-of-attention based on your own natural instincts. If you’re still not sure, watch the footage without sound, in a darkened room, and your visual intuition will usually take over and direct your eye to the same point on the screen that will attract the audience. Continuum of movement is a nearly invisible visual component that has an enormous impact on the audience. As the screen size increases, so does the chance for greater contrast of continuum of movement. As the screen shrinks in size, the chances for contrast of continuum diminish. Contrast and affinity of continuum of movement affect the intensity or dynamics of edited sequences. Visual intensity will increase as more contrast of continuum is used and visual intensity will decrease if there is affinity of continuum of movement. Affinity of continuum guides the audience’s point-of-attention as they look around the frame. The picture maker can manipulate the audience and control the area of the screen they watch (a critical factor in television commercials). In a completed film, the audience should be unaware of the editing. 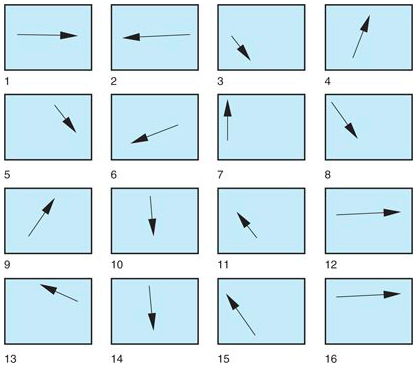 Affinity of continuum of movement improves visual continuity, and is such a powerful visual tool that it can disguise visual errors including continuity mistakes and screen direction problems. Affinity makes visual events and transitions appear continuous and smooth. Any contrast creates intensity. Contrast of continuum of movement can be visually disjointed, jarring, and abrupt. The audience can become agitated or excited when forced to quickly move their attention to different quadrants of the screen without apparent motivation. Contrast of continuum of movement separates actions and removes transitions. As the contrast of continuum increases, so will the visual intensity of the sequence.